Kansas' Republican-controlled Legislature is considering whether to override Gov. 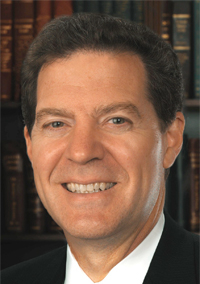 Sam Brownback's veto of a bill to expand Medicaid coverage to an estimated 150,000 low-income adults. Legislative leaders on Thursday were trying to pick up three additional Republican votes in the House and two in the Senate to override the veto and launch the Medicaid expansion in January. That would make deep-red Kansas the 32nd state to expand the program. It would signal that other GOP-led states may follow suit in the wake of last week's demise of the congressional Republican bill to repeal and replace the Affordable Care Act and phase out the law's Medicaid expansion. Other states debating expansion are Maine, North Carolina, Utah and Virginia. Brownback argued in his veto message that the Medicaid expansion bill is bad because it doesn't include a strict requirement that all able-bodied adults find a job. “We cannot help our citizens build better lives without also incentivizing them to find a permanent path out of poverty,” he wrote. But Krista Postai, CEO of the Community Health Center of Southeast Kansas, said that's the wrong way to look at the issue. Her clinic treats many working people who don't seek preventive care because they lack insurance and can't afford to pay for those services. Even with the clinic's help, they often can't access needed specialty care. Peggy Ashbaugh works in a diner in Cherokee, Kan., in the impoverished, heavily white, southeast corner of the state. In late 2015, she was diagnosed with a large kidney stone that required surgical removal. But she has no health insurance. On her $200 a week pay, she couldn't afford the operation. So Ashbaugh worked through the intense pain until October, when she finally was able to get the operation at the University of Kansas through a charity-care program. After eight weeks off work, the divorced 55-year-old is now waiting on customers again at the diner. She continues to struggle with paying for medications for her high blood pressure, high cholesterol and hyperglycemia. Postai, who previously voted for Brownback, is baffled by the governor's hardline opposition to Medicaid expansion. She has seen patients die because they were uninsured and put off seeking care until it was too late, like a farmer who first came in wracked with pain and was diagnosed with Stage 4 cancer. He died a few weeks later. Brownback's administration estimates expansion would be too expensive for the state which faces projected budget shortfalls totaling more than $1 billion through June 2019. But the Kansas Hospital Association, which backs an expansion as a way to help rural hospitals, argued that extra federal dollars would ripple through the economy, and the state would see a budget gain. Updated March 31, 2017. The story contained an error listing Peggy Ashbaugh with the first name, Laura. Her name was corrected.